Many recipes often call for seeds to be toasted. It just adds so much depth of flavor to dishes. There are two ways of doing this, either on the stove top or in the oven. Both methods are easy and it really only takes between 5 – 10 minutes and suits any type of seed, whether sesame, sunflower, pumpkin or cumin. Toasting seeds brings out their nuttiness and makes them crunchier, fabulous if you are adding them to salads or vegetable dishes. 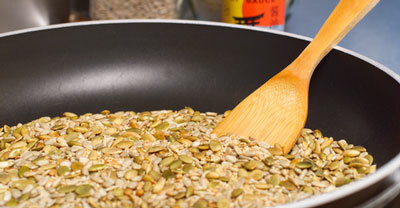 This is a quick and easy method that only takes about 5 minutes and suits small and medium sized batches of seeds. You will need a heavy-based skillet so that the heat is evenly distributed. 1. Spread the seeds in a wide skillet. 2. Place the skillet over a medium heat. 3. Stir constantly until they just begin to color. 4. When they begin to color turn the heat down as seeds burn quickly once they are hot. 5. Continue stirring or shaking the pan until the seeds are fragrant and a medium golden brown. 6. It should only take 1 – 2 minutes for the seeds to become brown and aromatic. 7. Remove the pan from the heat a little early as the seeds will continue to cook. 8. Immediately transfer the seeds to a plate to cool completely before using. This method is best for larger quantities of seeds and also has the added advantage of producing a more uniform golden brown. Line a baking sheet with baking paper. (A cookie sheet with sides is ideal for this purpose). Cook in the oven for 6 – 10 minutes or until they are golden brown. Remember to stir the seeds occasionally to ensure the seeds are a uniform color. Remove from the oven when they are a golden brown. 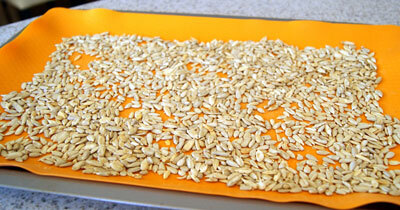 As with the stove-top method, keep a close watch on the seeds so they don’t burn and if unsure remove a little early. Remove from the oven and transfer to a plate immediately so they don’t continue to cook.